Berlin-based shingle Egoli Tossell Film and Film House Germany in Frankfurt have boarded Paul Andrew Williams’ ”Song for Marion,” starring Vanessa Redgrave. Pic marks the first collaboration between the German companies since Film House took over Egoli Tossell earlier this year. Williams’ London-based Steel Mill Pictures is producing along with Coolmore Productions and Aegis Film Fund. Gemma Arterton, Terence Stamp and Christopher Eccleston also star in the London-set comedy-drama about a grumpy pensioner who joins a local choir. The film is set to start shooting this month in North East England. A film which could do for choirs what Brassed Off did for brass bands begins shooting in the North East next week with a glittering cast led by Vanessa Redgrave and Terence Stamp. Gemma Arterton and Christopher Eccleston also star in the film, Song for Marion, and North East extras are being sought to appear as audience members during a six-week shoot. Gemma Arterton is to star as the conductor of a ‘rock choir’ in a new British film co-starring Vanessa Redgrave and Terence Stamp. The film called Song For Marion has been inspired by the surge in progressive community choirs around the country, spurred on by hit TV show Glee, and will feature music from Motorhead, Billy Joel, Stevie Wonder and Cyndi Lauper, the Daily Mail reports. Vanessa, 74, will play Marion who is a member of the local choir in the north-east of England, and she and her conductor, played by Bond girl Gemma, are both keen to get her retired husband Arthur, played by Priscilla Queen Of The Desert star Terence, to join. Christopher Eccleston has also been cast as the son who has a difficult relationship with his father. Producer Ken Marshall, from Steel Mill Pictures, revealed: “Both Vanessa and Terence can sing, and each has a big solo spot number”, adding that Vanessa’s number is a classic ballad “that will have you crying into your shirt.” The film will be directed by Paul Andrew Williams, whose debut, gritty drama London To Brighton, won much critical acclaim. The film begins shooting for six weeks at the end of July on location in and around County Durham. 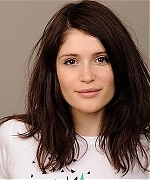 Gorgeous British actress Gemma Arterton is back in front of the camera for G-Star’s fall campaign. Following her first campaign in spring, Gemma’s new ads are similarly gritty and raw, but with a tougher edge to them. She shows off the brand’s 3301 denims, which she says “are definitely one of the style must-haves because they are so practical”. The ads and clothes Gemma wears hit stores in September. Vanessa Redgrave, Terence Stamp and Gemma Arterton are to get down and rock in a new movie. Song For Marion, which also stars Christopher Eccleston and Anne Reid, looks at the rock-choir phenomenon that has soared in all parts of the country, and abroad. A galaxy of stars are at Wimbledon as the 125th men’s final displays some sparkling tennis. Away from the Royal Box, famous faces punctuate the crowd. Bond Girl Gemma Arterton, 25, who starred in Quantum of Solace, sits beside her husband Stefano Catelli, a fashion sales manager. Gemma Arterton is expected to be among the 42 actors who will feature in the ‘Brits to watch’ dinner that the Duke and Duchess of Cambridge will attend. The Duke and Duchess of Cambridge have not yet packed their suitcases for their trip to North America, but tempers are already fraying among the actors who hope to meet them in Hollywood.